This category contains a complete range of certified organic hair care products, 100% petrochemical free, produced entirely from plant and mineral ingredients. 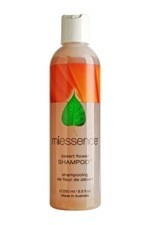 The featured organic shampoos, organic hair conditioning and organic styling products are made by two brands, Miessence and Sanctum, both of which are Australian Certified Organic manufacturers. Whilst Miessence was the first manufacturer worldwide to achieve these standards and is therefore the best recognised brand, Sanctum offers a very similar range at a fraction of the price, representing much better value for money. We have therefore chosen to offer both brands here, side by side for you to select and compare. 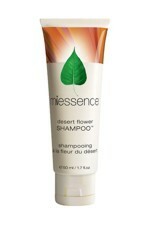 Miessence Desert Flower Shampoo (250ml) is ultra mild for daily use for all the family, even gentle enough for babies and children. Extremely mild Yucca juice and polyglucose gently cleanse the hair. Panthenol then moisturises the hair. Organic avocado oil restores lustre and hydrates dry and damaged ends. Organic herbs add sheen and body to your hair. This trial size of Miessence Desert Flower Shampoo (50ml), is an ultra mild for daily use for all the family, even gentle enough for babies and children. Extremely mild Yucca juice and polyglucose gently cleanse the hair. Panthenol then moisturises the hair. Organic avocado oil restores lustre and hydrates dry and damaged ends. Organic herbs add sheen and body to your hair. 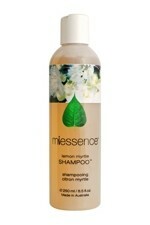 Miessence Lemon Myrtle Shampoo (250ml) is blended to cleanse and purify your normal/oily hair. A shampoo for oilier hair types, or for when you have been using a few too many styling agents! Be revitalised by the invigorating aroma of organic lemon myrtle. Miessence Protect Hair Repair (250ml) provides long lasting moisturisation, imparts lustre and helps to condition the hair. The organic rosehip seed oil within the formula moisturises and softens dry, brittle ends. Organic herbals then help to rebuild strength and body and prevent tangles, giving your hair a smoother texture. Sanctum Conditioner for Dry Hair (200ml). The rich conditioner is formulated to protect and nourish dry hair. 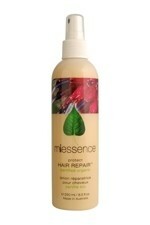 This repair conditioner aims to increase the natural healthy shine and movement of the hair. For daily use on hair that tends to be regularly dry, brittle and unmanageable. 100% Naturally Derived. 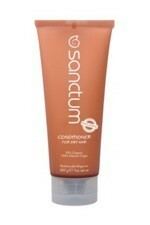 Sanctum Conditioner for Normal Hair (200ml). This nourishing conditioner helps provide daily protection from environmental stress and damage. Natural ingredients lock into the hair follicles to promote healthy hair, whilst restoring the moisture balance. For daily use on normal hair. 100% Naturally Derived. Sanctum Conditioner for Treated Hair (200ml). Blended with Moroccan Argan Oil this conditioner is rich in essential nutrients to help renew and repair hair follicles. Reduces tangles and increases manageability by restoring smoothness to hair. Hair will appear shiny and luxurious. For daily use on hair that has been coloured, permed or damaged. 100% Naturally Derived. 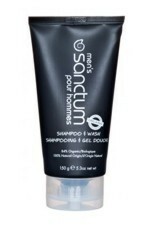 Sanctum Organic Men's Shampoo & Shower Gel (150ml). A woody scented soap-free hair and body cleanser. This minimum fuss shower gel is gentle enough to use daily and foams up with water. For all men and used on a daily basis. Certified Organic 84% and 100% Naturally Derived. 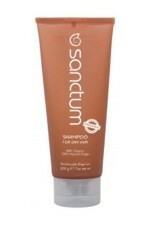 Sanctum Organic Shampoo for Dry Hair (200ml). 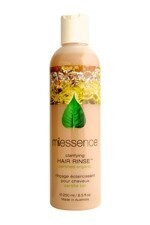 This pH balanced shampoo provides a gentle cleansing lather that helps protect and renew the hair. For daily use on hair that tends to be regularly dry, brittle and unmanageable. Certified Organic 84% and 100% Naturally Derived.